LUPE hosted a fast and prayer chain at Archer Park on Saturday, June 30, 2018, in McAllen. 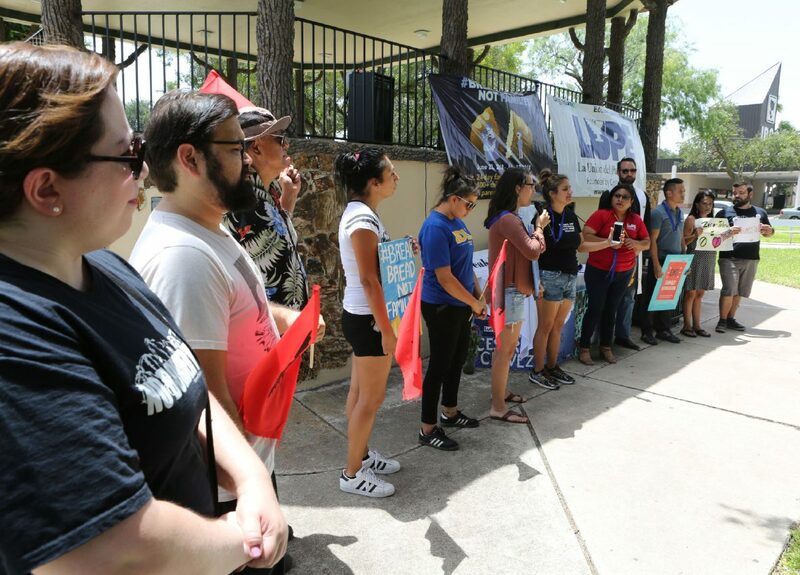 In reaction to the Trump administration’s “zero-tolerance” policy that led to the separation of immigrant families, the local chapter of the civil rights organization LUPE is leading a nearly monthlong hunger strike and prayer chain called Break Bread, Not Families. On Saturday, comedian Cristela Alonzo visited her hometown to join the fast. 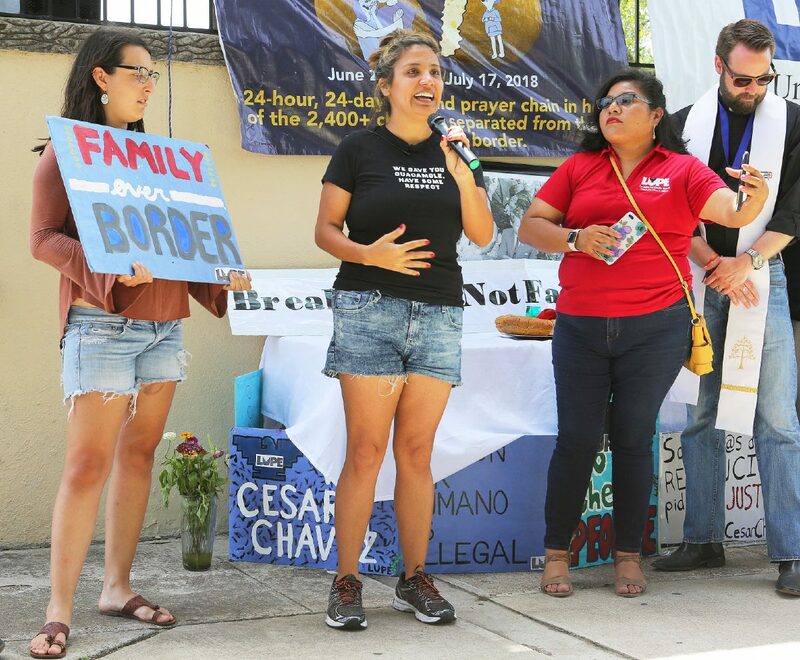 Participants pledge to fast for 24 hours before passing on their fast to someone else, creating a chain of nonviolent protests for 24 days to represent the estimated 2,400 migrant children separated from their parents at the border. Each day since June 24, LUPE and those beginning their fast meet at Archer Park in McAllen at noon. They begin with a prayer, participants explain why they are joining the movement, and everyone encourages each other to become more involved. This will continue until July 17. LUPE hosts a fast and prayer chain at Archer Park on Saturday, June 30, 2018, in McAllen. Rev. 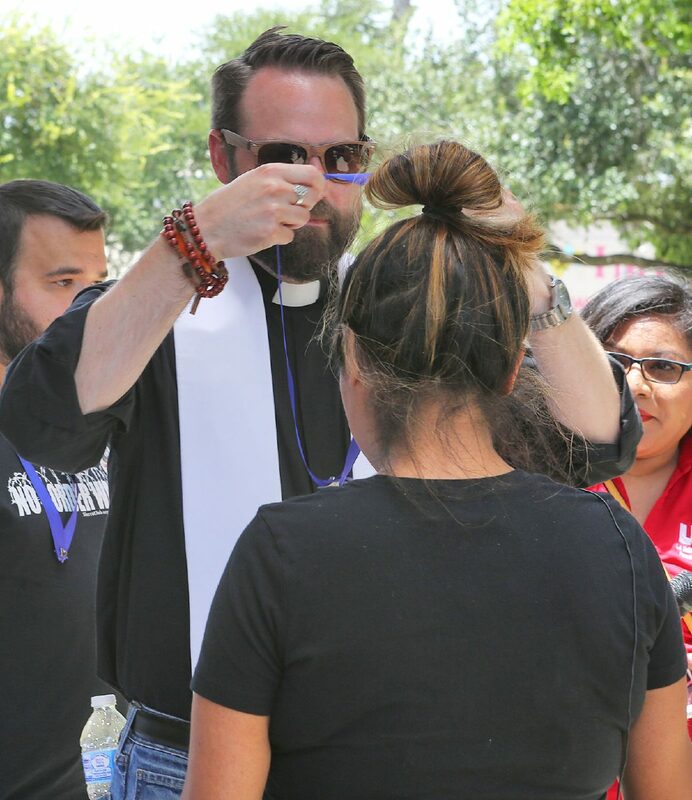 Ryan M. Eller passes a fasting ribbon on to Cristela Alonzo as LUPE hosts a fast and prayer chain at Archer Park on Saturday, June 30, 2018, in McAllen. Cristela Alonzo speaks as LUPE hosts a fast and prayer chain at Archer Park on Saturday, June 30, 2018, in McAllen. The ultimate goal is to show solidarity with the children who are still detained and unaccounted for, and anyone who has been affected by the strict immigration policy. “Everyone is wondering how are the families going to be reunified because there isn’t a process for that yet,” said LUPE representative Tania Chavez. The campaign was organized by La Union Entero del Pueblo, Robert F. Kennedy Human Rights, the Texas Civil Rights Project and NETA. 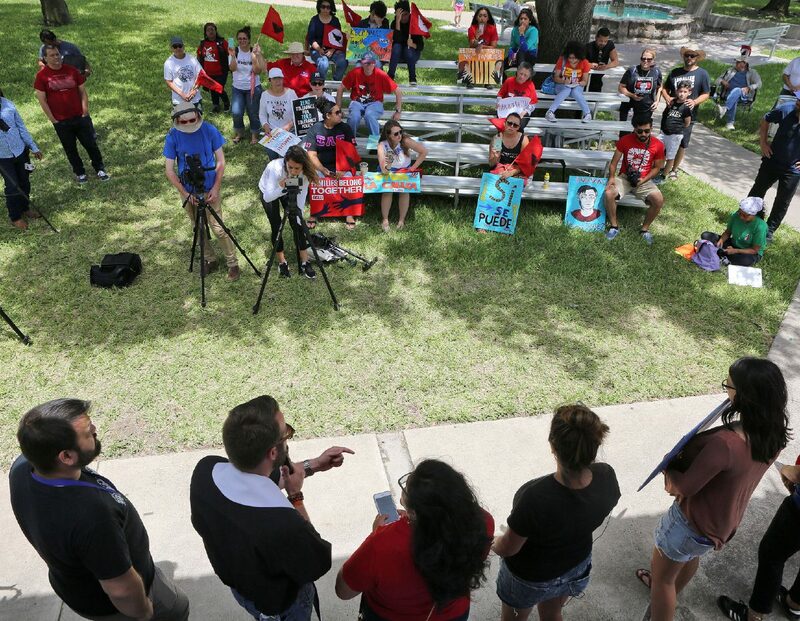 Chavez said the name of the movement was chosen to portray a sense of community and support between the Rio Grande Valley and those being detained. Alonzo, a native of San Juan who had her own sitcom on ABC and has a Netflix comedy special, echoed Chavez’s sentiment. On Saturday, she took the fast from her friend Ryan Eller, the executive director for Define American and a Baptist church pastor in Louisville, Kentucky. Define American is a nonprofit organization whose mission is to “shift the conversation about immigrants, identity and citizenship” in the country. Eller, who fasted on Friday, said he and a group went to the Casa Padre shelter in Brownsville yesterday to pray for the children there and “let them know they are loved,” but they were not allowed in or given any information. After receiving Eller’s fast, Alonzo said she was born in Texas but her mother and brother were not. She remembers the fear she had growing up, which makes her feel connected to the children in the centers. “We were very lucky that we weren’t separated, and it’s because of that that I’ve had the opportunities to do so many great things,” Alonzo said. She was in New York when movement gained popularity. There was a protest in Washington, D.C., only three hours away. But she felt she needed to join the movement from home with her family and friends. The fasting aspect of Break Bread, Not Families originates from Cesar Chavez, the co-founder of LUPE. He used hunger strikes as a form of nonviolent protest and was visited by Robert F. Kennedy during the farm worker’s movement. This partnership was recreated when Robert’s daughter, Kerry Kennedy, passed on her fast to Dolores Huerta, Chavez’s co-founder, on the first day of the campaign in Archer Park. Now that it’s spread across the nation, the Valley has seen notable figures like actress Evan Rachel Wood, who visited on the second day of the campaign. Tania Chavez of LUPE said people joining come from all backgrounds, including volunteers at the local respite center, immigrants who have experienced family separations, and undocumented people living on the border. One woman began her three-day fast on Saturday and Chavez recalled a group that fasted for six days.